I was just moving out of a phase of painting my "Persistence of Pink" show of macro views of primarily pink flowers. The rich greens and yellow striping of this blooming plant with its touch of pink was a good transition to a new set of paintings. 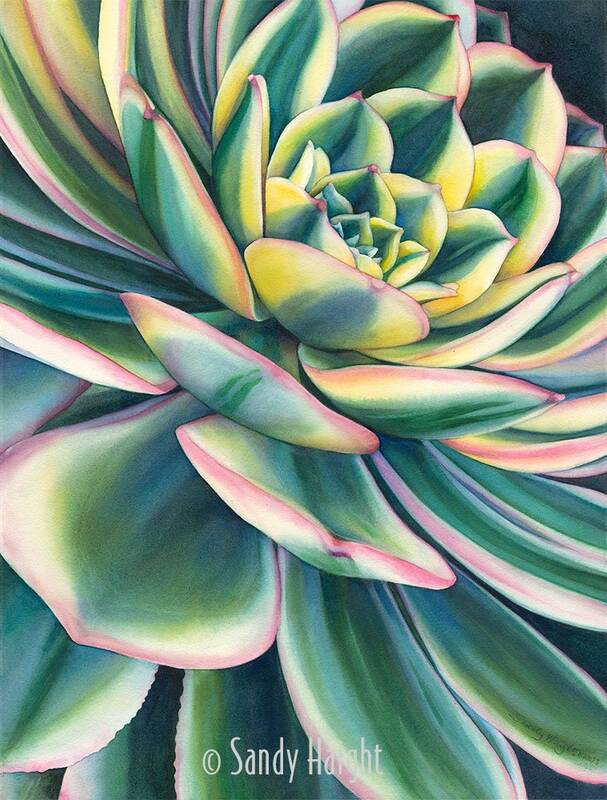 That new direction became a series of large succulent paintings that I spent 2018 working on for a November show in Anacortes, WA. This watercolor is painted on 300# Arches Cold Press paper. It is an original watercolor painting on a full sheet with deckle edge. A Certificate of Authenticity comes with the watercolor signed by Sandy Haight. It is framed with a 1" contemporary white metal frame and archival white foam core backing floating the artwork without a mat to reveal the deckle edge of the paper.